Boscovs, Inc. is a privately owned department store that operates in the Mid Atlantic region of the United States. The 44 stores specialize in famous name brand clothing, footwear, house wares, jewelry and toys for all ages. There are stores in 7 states and in 2006 revenues were reported as US 1.05 billion. If you have a problem with a Boscovs purchase you may call 1-800-284-8155. If you want to contact CEO, Albert Boscov, you may address you postal letter to him at 4500 Perkiomen Avenue, Reading, PA 19606. The corporate office phone number is 610-779-2000. The fax number is 610-370-3495. If you want to receive Customer Support by email you may find contact information here. 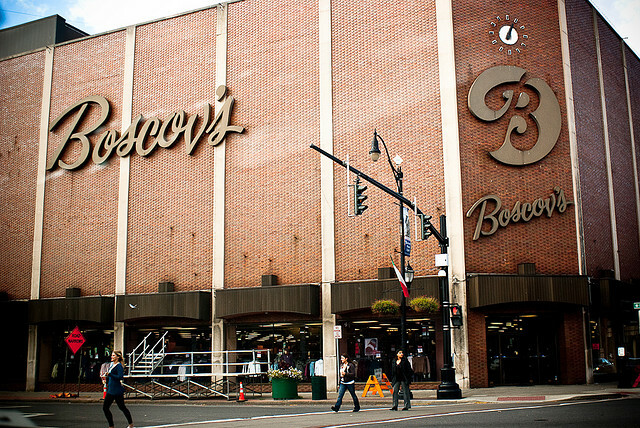 Boscovs was founded in 1914 by Solomon Boscov, a Jewish immigrant who arrived in the United States with less than 2 dollars to his name. The chain was founded and remains headquartered in Reading, Pennsylvania. You may find social presence on Facebook, Twitter, Instagram and Pinterest. This is not about Palmer Park Mall store the associate was more than helpful calling other stores to find me an item .However the complaint is about store 66 Albany .The item I was looking for was available showing 4 items at this store however the clerk would not go check sizes . This happened around 4:00 Pm April 11th.In Albany store woman's department. I stood there listening to Sarah from Easton store trying to help me.She persisted and did find me the item at another store.That clerk was helpful and took time to look.That associate at store 66 in the woman's deopartment at 4pm should be reprimanded .The customer comes first.Thank god the manager at Palmer Park mall has told her associates this.I love shopping at Boscovs did not like like that this lazy person would not help us today. Please address this with store 66.Thank You. Tina Cellus or Sellis in the infant Department, the cashier, would not assist us with a deal going on in the store today only. Instead she asked me to step aside instead of assisting us and calling a manager to get the approval to do the right thing. I refused to step aside since I was first in line and just decided to get the items I really needed which are going to be returned due to this terrible service today. A manager was finally called when I was leaving the register after asking for the employee's name. I asked for a manager in the beginning and she told me she was the manager, she should have called for help in the beginning and she was unable to help assist the customer. This issue should not be taken lightly and additional coaching is required for Tia! No customer service. Employees have no training at all. Visited the new Milford, Ct store. Female in women's dept. had no idea where ladies room was. In men's dept. 2 associates had no idea what a Check sweater was and they made no attempt to find out. Three men talking together in men's dept. Two could have been dept manager. When I expressed my frustration, they ignored the comp. and changed subject. Bad service. For the elderly, the price of coffee at $2.11 is crazy when they can stop at McDonald's for $1.06. Elderly would walk through the store and make a purchase. Hope this is going to the right people to take a look. I have other ideas that will save money and make Boscov's a great eating experience. I have a complaint regarding the lack of restrooms and the distance between the ones you have. Your store in Erie is a very large store, and you definitely need more restrooms, preferably located closer to the entrances, or more in the center of the store. Last week the restroom on the 1st floor was closed, due to cleaning, in the middle of the afternoon, and when I went to the 2nd floor, which only has 1 stall, was out of order. Please make some changes, as I've spoken to many customers, who also need more restrooms and not so far apart. My other complaint, is there are not enough customer service employees at the check out counters. Myself and another customer (we didn't know each other) walked all over the store and finally had to check out at the purse counter. There was no one at any of the other counters. Please make some changes, or you're going to lose sales. The racks and fixtures are way to close together to access the products in the departments. Having an associate to help, if one can be found, is not making a satisfying shopping experience. A person with a mobility device or even a baby stroller should not have to go through this aggravation. Someone with a wheelchair, walker, baby stroller even a cane can hardly get through the shelves and fixtures. These fixtures are not properly spread apart according to ADA requirements. 11/25/2017-Susquehanna Valley Mall store about 12:11pm, had large order went to check out and a young lady started to help. a man who's name tag read "Robert, Assit. manager, was there, ask I there were any coupons and he became very negative, "stated that is why Boscov almost went into bankruptcy, there will be no more coupons!" I again ask why and he stated very heatedly "we no longer will pamper our customers!!!" Taken completely be surprise I stated you damn well should! My step son and I were appalled to be treated like this! If I had not been buying gifts for my Granddaughter I would have left the merchandise and walked out. I felt bad for the young girl clerk, she stated she had only been working there 4 days. Al, when he was alive, would have been horrified by customers being treated so badly. I am and have been a faithful customer, but I will not be treated like I was today! I would like this person reprimanded, his attitude was awful! I highly doubt anybody will listen or care when I say this... but here it goes. Binghamton Boscovs is a joke. A majority of the employees don't seem to be fit for wanting to actually work. While finishing up some last minute Christmas shopping in their store, I came In on the 3rd floor.. and so it began. Upon shopping in the housewares area I overheard two employees discussing how the one young man was going to be leaving, he didn't want to stay until his shift ended. He asked a fellow employee to clock him back in, in a half hour so it looked like he came back in from his 30 minute meal break. Since I am a manager In retail myself I was stunned, but I figured not my store not my business. I continued my shopping, and went to the register to see if I could have a few items in my cart price checked. I waited by the register near as seen on tv for a few minutes while neither of the two young men I seen earlier was no where to be found. I was getting frustrated and was about to put my items back when a young lady from the curtain area seen me waiting and offered I come to her department and she would check me out. She was very friendly, and actually ended up helping me pick out some curtains though I didn't come in with intentions of purchasing curtains, she rang what I picked out as well as the items from the other dept and wished me a merry Christmas. I didn't catch her name though I wish I would have now, however through conversation she did tell me she has been in curtains for a little over a year now. I can see why, she's experienced and friendly. After leaving the curtain area I went to see if I could pick out a blanket for my daughter. I found one lady working the register swamped with customers. I waited and asked for her help when she had a minute, she very kindly helped me pick out a blanket as well as some pillows. She, like the curtain lady was a delight to deal with. I did catch her badge said asst manager. I moved down to the second floor to see if I could find some women's pajamas. I could not find anyone to check me out for at least 15 minutes. And when the girl finally did acknowledge me she asked very rudely what she could do for me. When I told her I was ready to check out I was told "that's nice you need to go to another register. I have things to do." Since I had come in a week or two prior to this and also had a horrible experience on the 1st floor, I called it quits and will not be shopping at your store any longer. As a side note my niece has witnessed employees out in the ramps with their badges on smoking weed. It's unbelievable what your store management seems to tolerate from employees. I however will not be shopping there any longer and wished I had made this complaint when I was there however these last few weeks have been busy but someone really needs to look In to this store! It's by far the biggest retail joke I've ever seen and again being a retail manager myself I would be appalled if this were my store. We are two retired seniors who live alone. In September 2014 we purchased two recliner chairs from Boscov's. We have no children living in the house to misuse furniture. One of the two recliners will no longer tilt back and the seat cushion has dropped down on one side. Something in the frame underneath has let go and the chair is useless. Customer service when contacted said they could do nothing about it. This chair has had little use and looks brand new. It had a faulty frame that let go under very little use. This should be replaced at no charge as it is faulty merchandise. We have many family members in the area that shop at Boscov's and we spend a lot of money there. I can not recommend anyone purchase any furniture from Boscov's as it is inferior quality and falls apart. Boscov's does not stand behind their merchandise. I was at the Atlantic city Boscov's store on November 15, 2016. I went to the second floor to get the military discount and was told this was no longer being accepted. My husband hates shopping . I do all the buying and have used this card for years. My husband is a Vietnam veteran...73....I am also 73. Boscov's does not make it easy. You have to walk up two flights of stairs and then they tell you the ID is no good. I would need my own. Why can't they send you a notice with your statement? Why can't this be located on the first floor? Don't advertise That you support military and pull this crap. I was out the Sunday after Christmas doing returns at white Marsh Mall Boscovs in Baltimore, MD. I had received a pair of pants and needed to exchange them for another size the store in White Marsh did not have the size I needed so they offered to get me another pair from another store shipped to my house I agreed and it sounded great. Once the girl had called a few stores and found me a pair in my size the girl asked me for my credit card information I said why cant I use the store credit they told me I could not. I had asked to speak to the manager the girl behind the desk who was very helpful and nice got me a manager I told the manager what was gong on she said that I was not allowed to use the store credit over the phone because they need to have the actual card in the stores possession because they keep track of them. I then left the store very unsatisfied so I continued to think about it and called costumer service today 1-5-16 and they told me that I could use the store credit over the phone. so I head back to Boscovs to give it another shot. The same girl that had helped me that day is the same one that helped me today she told me the something as last time and said she has only even seen it like that, but she called customer service and told them what was going on and they said i could use my credit so she called around once again and found my pants. I left very very happy and the girl Jasmine was so so very helpful and patient every time I went in. My only suggestion is get managers that know what they are doing so I didn't have to waste my time and gas to keep running to the store. On August 18th I purchased an inexpensive window blind asking that it measure 35 1/2". Brought it home, attempted to hang it but it was too short. Upon measuring it I determined it was 1/8" shy of the length I needed. So, the next day I attempted to simply get another blind that was correctly cut but was told by the salesman that they could not add to the blind to make it the length I needed. Explaining that I simply wanted to exchange for one that was cut to the correct measurement, I was told I'd have to buy another one. Pressing further, I explained that when I measured the blind at home it did not measure the length I needed and was told that something was wrong with my Stanley measuring tape! My husband, a carpenter, measured that blind that same evening and in fact discovered it was cut too short. Not only is the policy skewed but the rudeness of the associates has always been and remains unbeatable. I am a plus size and to get some real fashionable dresses is difficult. But Boscov's are the right place to shop such things. I find it very comfortable and reasonable on the pocket too. Their prices are hard to beat anywhere. A truly wonderful store. The staff out there were quite pleasing and helped me during my selection of clothes. Boscov's have apparel for people who are too thin or petite as well. Great place to shop at and wonderful quality stuff.